While the Job object may seem like a simple container for steps, there are many configuration options of which a developer must be aware. Furthermore, there are many considerations for how a Job will be run and how its meta-data will be stored during that run. This chapter will explain the various configuration options and runtime concerns of a Job. There are multiple implementations of the Job interface, however builders abstract away the difference in configuration. A Job (and typically any Step within it) requires a JobRepository. The configuration of the JobRepository is handled via the BatchConfigurer. The above example illustrates a Job that consists of three Step instances. The job related builders can also contain other elements that help with parallelisation (Split), declarative flow control (Decision) and externalization of flow definitions (Flow). There are multiple implementations of the Job interface, however, the namespace abstracts away the differences in configuration. It has only three required dependencies: a name, a JobRepository , and a list of Step instances. In addition to steps a job configuration can contain other elements that help with parallelisation (<split>), declarative flow control (<decision>) and externalization of flow definitions (<flow/>). This snippet of JUnit code shows how attempting to create a JobExecution the first time for a non restartable job will cause no issues. However, the second attempt will throw a JobRestartException. If a group of Jobs share similar, but not identical, configurations, then it may be helpful to define a "parent" Job from which the concrete Jobs may inherit properties. Similar to class inheritance in Java, the "child" Job will combine its elements and attributes with the parent’s. In the following example, "baseJob" is an abstract Job definition that defines only a list of listeners. The Job "job1" is a concrete definition that inherits the list of listeners from "baseJob" and merges it with its own list of listeners to produce a Job with two listeners and one Step, "step1". Please see the section on Inheriting from a Parent Step for more detailed information. A job declared in the XML namespace or using any subclass of AbstractJob can optionally declare a validator for the job parameters at runtime. This is useful when for instance you need to assert that a job is started with all its mandatory parameters. There is a DefaultJobParametersValidator that can be used to constrain combinations of simple mandatory and optional parameters, and for more complex constraints you can implement the interface yourself. The validator can be specified as a reference (as above) or as a nested bean definition in the beans namespace. Spring 3 brought the ability to configure applications via java in addition to XML. As of Spring Batch 2.2.0, batch jobs can be configured using the same java config. There are two components for the java based configuration: the @EnableBatchProcessing annotation and two builders. JobRepository - bean name "jobRepository"
JobLauncher - bean name "jobLauncher"
JobRegistry - bean name "jobRegistry"
PlatformTransactionManager - bean name "transactionManager"
JobBuilderFactory - bean name "jobBuilders"
StepBuilderFactory - bean name "stepBuilders"
The core interface for this configuration is the BatchConfigurer. The default implementation provides the beans mentioned above and requires a DataSource as a bean within the context to be provided. This data source will be used by the JobRepository. Only one configuration class needs to have the @EnableBatchProcessing annotation. Once you have a class annotated with it, you will have all of the above available. With the base configuration in place, a user can use the provided builder factories to configure a job. Below is an example of a two step job configured via the JobBuilderFactory and the StepBuilderFactory. When using @EnableBatchProcessing, a JobRepository is provided out of the box for you. This section addresses configuring your own. 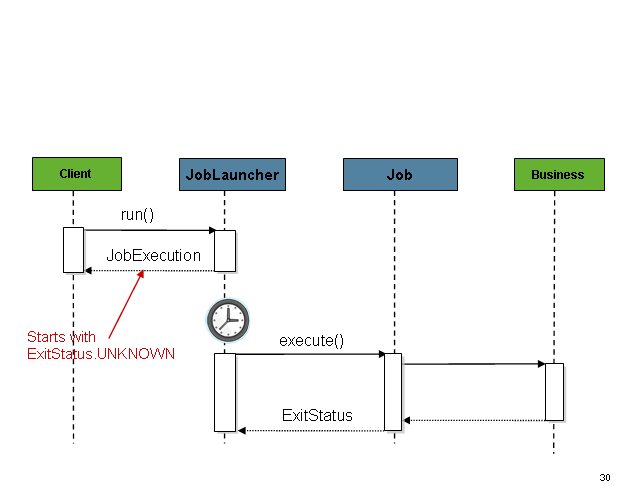 As described in earlier, the JobRepository is used for basic CRUD operations of the various persisted domain objects within Spring Batch, such as JobExecution and StepExecution. It is required by many of the major framework features, such as the JobLauncher, Job, and Step. When using java configuration, a JobRepository is provided for you. A JDBC based one is provided out of the box if a DataSource is provided, the Map based one if not. However you can customize the configuration of the JobRepository via an implementation of the BatchConfigurer interface. This fragment can be used as is, with almost no changes. Remember also to include the appropriate namespace declarations and to make sure spring-tx and spring-aop (or the whole of spring) are on the classpath. Given the above changes, every query to the meta data tables will be prefixed with "SYSTEM.TEST_". BATCH_JOB_EXECUTION will be referred to as SYSTEM.TEST_JOB_EXECUTION. Only the table prefix is configurable. The table and column names are not. Note that the in-memory repository is volatile and so does not allow restart between JVM instances. It also cannot guarantee that two job instances with the same parameters are launched simultaneously, and is not suitable for use in a multi-threaded Job, or a locally partitioned Step. So use the database version of the repository wherever you need those features. However it does require a transaction manager to be defined because there are rollback semantics within the repository, and because the business logic might still be transactional (e.g. RDBMS access). For testing purposes many people find the ResourcelessTransactionManager useful. (The JobRepositoryFactoryBean tries to auto-detect the database type from the DataSource if it is not specified.) The major differences between platforms are mainly accounted for by the strategy for incrementing primary keys, so often it might be necessary to override the incrementerFactory as well (using one of the standard implementations from the Spring Framework). If even that doesn’t work, or you are not using an RDBMS, then the only option may be to implement the various Dao interfaces that the SimpleJobRepository depends on and wire one up manually in the normal Spring way. When using @EnableBatchProcessing, a JobRegistry is provided out of the box for you. This section addresses configuring your own. Any implementation of the spring TaskExecutor interface can be used to control how jobs are asynchronously executed. At a minimum, launching a batch job requires two things: the Job to be launched and a JobLauncher. Both can be contained within the same context or different contexts. For example, if launching a job from the command line, a new JVM will be instantiated for each Job, and thus every job will have its own JobLauncher. However, if running from within a web container within the scope of an HttpRequest, there will usually be one JobLauncher, configured for asynchronous job launching, that multiple requests will invoke to launch their jobs. For users that want to run their jobs from an enterprise scheduler, the command line is the primary interface. This is because most schedulers (with the exception of Quartz unless using the NativeJob) work directly with operating system processes, primarily kicked off with shell scripts. There are many ways to launch a Java process besides a shell script, such as Perl, Ruby, or even 'build tools' such as ant or maven. However, because most people are familiar with shell scripts, this example will focus on them. 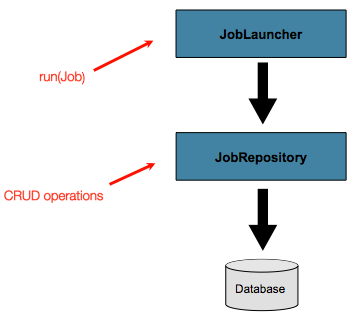 Use the JobLauncher provided in the application context to launch the job. The name of the job to be run. The essential contract of an ExitCodeMapper is that, given a string exit code, a number representation will be returned. The default implementation used by the job runner is the SimpleJvmExitCodeMapper that returns 0 for completion, 1 for generic errors, and 2 for any job runner errors such as not being able to find a Job in the provided context. If anything more complex than the 3 values above is needed, then a custom implementation of the ExitCodeMapper interface must be supplied. Because the CommandLineJobRunner is the class that creates an ApplicationContext, and thus cannot be 'wired together', any values that need to be overwritten must be autowired. This means that if an implementation of ExitCodeMapper is found within the BeanFactory, it will be injected into the runner after the context is created. All that needs to be done to provide your own ExitCodeMapper is to declare the implementation as a root level bean and ensure that it is part of the ApplicationContext that is loaded by the runner. The JobExplorer and JobOperator interfaces, which will be discussed below, add additional functionality for querying and controlling the meta data. A JobRegistry (and its parent interface JobLocator) is not mandatory, but it can be useful if you want to keep track of which jobs are available in the context. 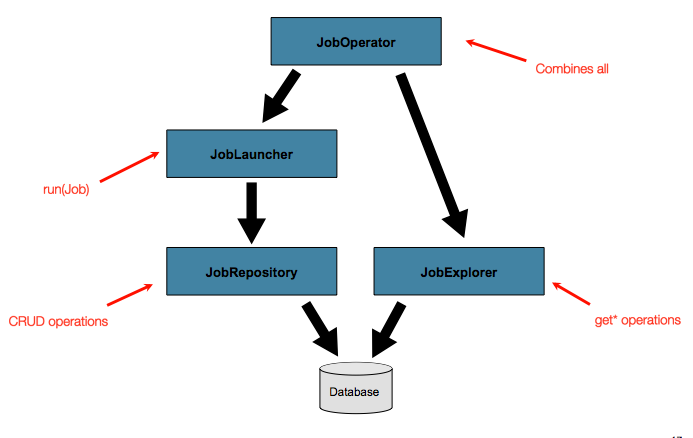 It is also useful for collecting jobs centrally in an application context when they have been created elsewhere (e.g. in child contexts). Custom JobRegistry implementations can also be used to manipulate the names and other properties of the jobs that are registered. There is only one implementation provided by the framework and this is based on a simple map from job name to job instance. There are two ways to populate a JobRegistry automatically: using a bean post processor and using a registrar lifecycle component. These two mechanisms are described in the following sections. Although it is not strictly necessary, the post-processor in the example has been given an id so that it can be included in child contexts (e.g. as a parent bean definition) and cause all jobs created there to also be registered automatically. This is a lifecycle component that creates child contexts and registers jobs from those contexts as they are created. One advantage of doing this is that, while the job names in the child contexts still have to be globally unique in the registry, their dependencies can have "natural" names. So for example, you can create a set of XML configuration files each having only one Job, but all having different definitions of an ItemReader with the same bean name, e.g. "reader". If all those files were imported into the same context, the reader definitions would clash and override one another, but with the automatic registrar this is avoided. This makes it easier to integrate jobs contributed from separate modules of an application. The registrar has two mandatory properties, one is an array of ApplicationContextFactory (here created from a convenient factory bean), and the other is a JobLoader. The JobLoader is responsible for managing the lifecycle of the child contexts and registering jobs in the JobRegistry. The ApplicationContextFactory is responsible for creating the child context and the most common usage would be as above using a ClassPathXmlApplicationContextFactory. One of the features of this factory is that by default it copies some of the configuration down from the parent context to the child. So for instance you don’t have to re-define the PropertyPlaceholderConfigurer or AOP configuration in the child, if it should be the same as the parent. The AutomaticJobRegistrar can be used in conjunction with a JobRegistryBeanPostProcessor if desired (as long as the DefaultJobLoader is used as well). For instance this might be desirable if there are jobs defined in the main parent context as well as in the child locations. * infrastructure out of the box. If you set the table prefix on the job repository, don’t forget to set it on the job explorer as well. In this example, the value with a key of 'run.id' is used to discriminate between JobInstances. If the JobParameters passed in is null, it can be assumed that the Job has never been run before and thus its initial state can be returned. However, if not, the old value is obtained, incremented by one, and returned. The shutdown is not immediate, since there is no way to force immediate shutdown, especially if the execution is currently in developer code that the framework has no control over, such as a business service. However, as soon as control is returned back to the framework, it will set the status of the current StepExecution to BatchStatus.STOPPED, save it, then do the same for the JobExecution before finishing. 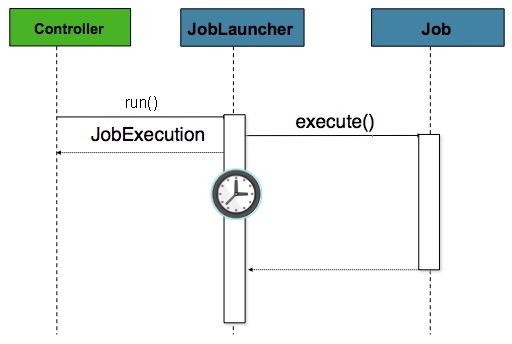 A job execution which is FAILED can be restarted (if the Job is restartable). A job execution whose status is ABANDONED will not be restarted by the framework. 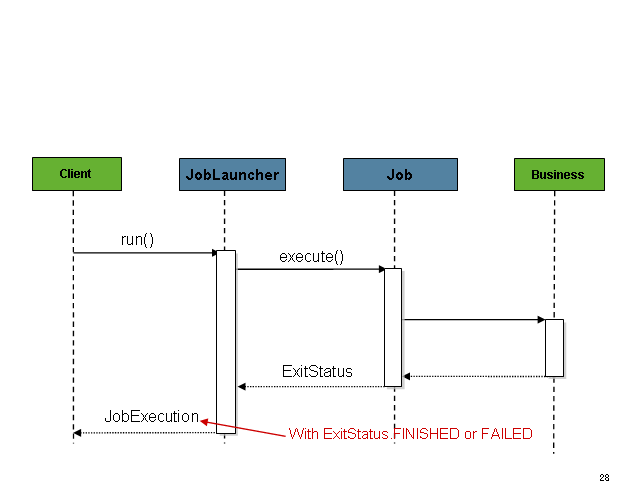 The ABANDONED status is also used in step executions to mark them as skippable in a restarted job execution: if a job is executing and encounters a step that has been marked ABANDONED in the previous failed job execution, it will move on to the next step (as determined by the job flow definition and the step execution exit status). If the process died ("kill -9" or server failure) the job is, of course, not running, but the JobRepository has no way of knowing because no-one told it before the process died. You have to tell it manually that you know that the execution either failed or should be considered aborted (change its status to FAILED or ABANDONED) - it’s a business decision and there is no way to automate it. Only change the status to FAILED if it is not restartable, or if you know the restart data is valid. There is a utility in Spring Batch Admin JobService to abort a job execution.